Juliana has always been a girly girl. She prefers princesses and dress-up to cars and blocks. When we bought trucks for her at age two, they became princess vehicles. 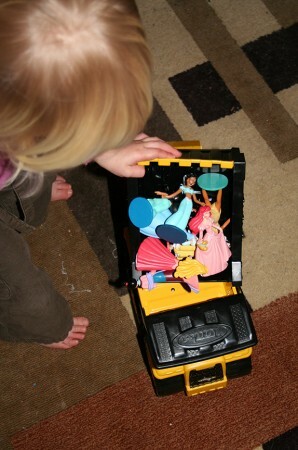 She would fill the front loader with princesses, tip them into the dump truck and then push them around the room (we called this game dump truck princess). So we continued to buy the toys that she played with most and amassed a sizable collection of “girl” toys. 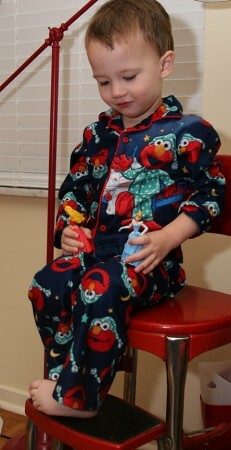 Now that we have two wild boys in the house we have lots of traditional toys for boys…so many cars and trucks. 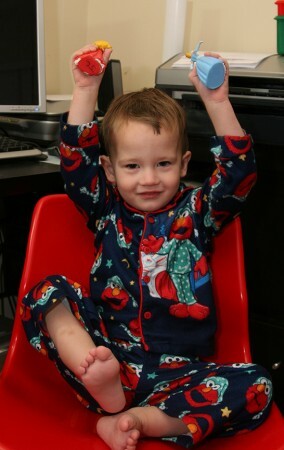 They also love playing with Juliana’s toys. They love Princesses and have started to learn all of their names. They are partial to the classics – Cinderella and Aurora are their favorites. They walk around in princess shoes and it is only a matter of time before one of them asks to wear a princess dress. Wyatt has always loved stuffed animals, but Ruslan didn’t care for them as much. 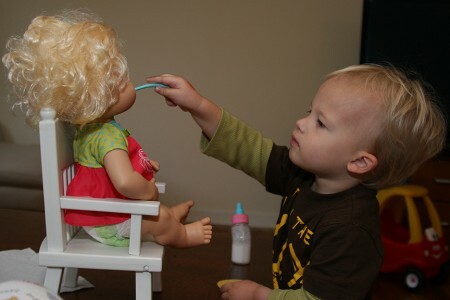 Recently they have both started to play with dolls – Ruslan loves Cutie Pie and carries her around the house giving her lots of hugs and kisses. We have a vast assortment of princess and pink purses. 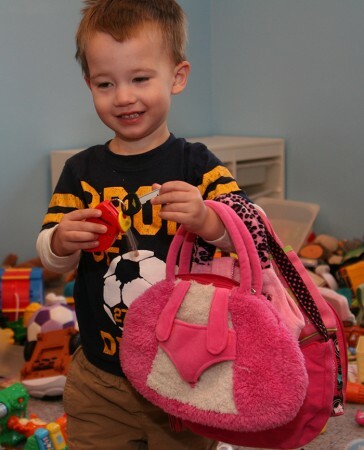 The boys use them to hide toys from each other and to carry items from one room to another. 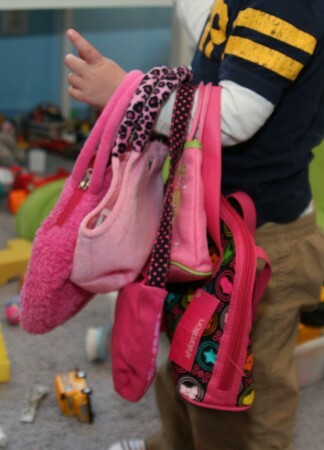 Or they simply collect as many purses as possible and carry them around the house. i’m loving that j used the truck to transport the dolls. brilliant! 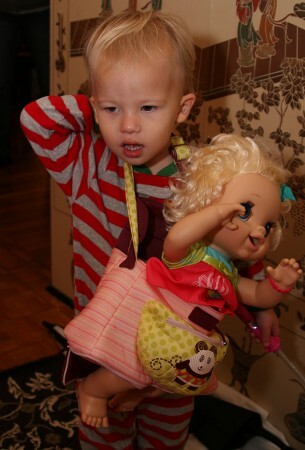 So far, Michael has sported hair bands and bows, and I’m sure he will find dolls and purses to play with. Kids don’t care about pink or blue when they are so little. I’m reading “Cinderella Ate My Daughter” right now, and so far it’s a lot of hand wringing and very little insight. Michael hasn’t been dressed in a dress yet, but I’m sure Kate has plans for him along those lines.